Coburg have had their first win of the season snatched from them in a heartbreaking finish against Sandringham; the final scores 79 a piece. Despite being two men down on the bench, the Lions looked stronger than ever in the final term and kicked six unanswered goals, three coming from vice-captain Peter McEvoy, to come back from a 32 point deficit at three-quarter time. 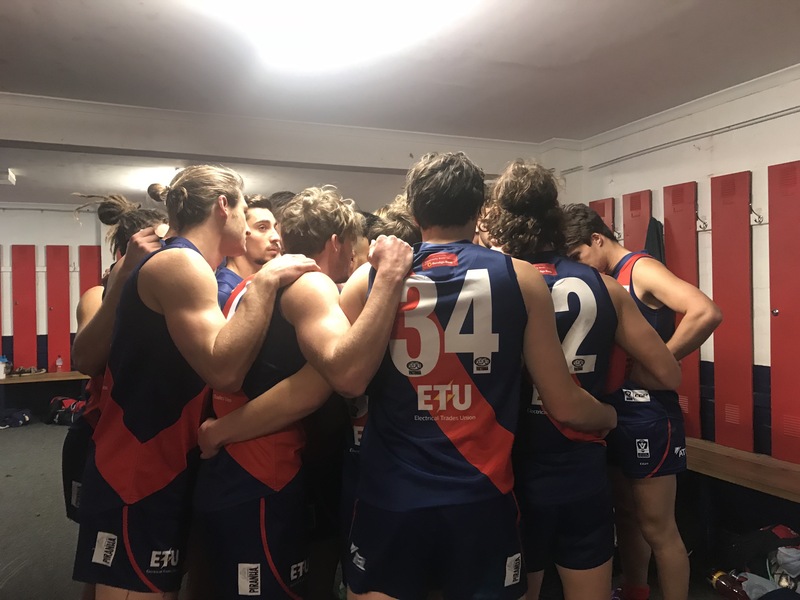 Up by six points in the dying minutes and looking to record their maiden victory, Coburg did everything they could to prevent Sandringham from scoring on Saturday afternoon at Piranha Park. Unluckily, Doulton Langlands of the Zebras was awarded a free kick and had the opportunity to level after the siren. To the delight of the Coburg FC faithful, Langlands’ kick had fallen short; however in a twist of events a 50m penalty had been called, meaning the Zebras would get another chance from the goal square. Regardless of the final score, the young Lions side were very impressive, showing exciting ball movement, a boost in confidence, and a vast improvement from last week’s performance. It was an effort to be proud of, and an effort that will go down as a huge positive in their books. Vice-captain Nick Mellington (25 touches, eight tackles and three clearances) had a great impact whenever he was near the ball, and was supported by Luke Bunker (22 touches, 11 clearances) and Marcus Lentini (28 disposals, nine clearances) who put the pressure on when needed. Lochie Dickson (28 disposals, ten rebound-50s), Nathan Blair (15 disposals, five tackles) and Jesse Corigliano (20 disposals, 12 rebound-50s) were a deadly combination in the backline, and definitely helped drive the ball out of defence on multiple occasions. Tyson Lever had a big clash of heads with Sandringham’s Kyle Answerth and came off with the blood rule, but returned in the second half and even managed a goal. Debutant Brad Bernacki played his role, and finished with 14 touches and five tackles. Speaking post-match, head coach Leigh ‘Patch’ Adams felt a mix of emotions but was still very proud of his side. Adams thought his side played “pretty well” throughout the whole game, and commended their defensive efforts when Sandringham had the upper hand. The Lions wore purple shoelaces as a tribute to Maddie Riewoldt, with the day also dedicated to raising funds for Maddie Riewoldt’s Vision. Next week sees Coburg stay at home to take on fellow standalone side Frankston, on Sunday at 2pm for their annual NAIDOC match. It will be their third final game on home soil, so be sure to come down and support the Lions to hopefully see them get over the line.